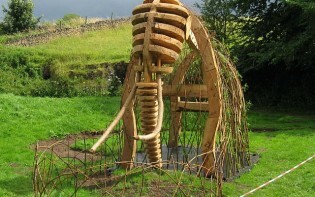 In the heart of Derbyshire, surrounded by steep limestone hills and underground caverns, lies the “Gem of the Peaks”. Castleton is settled at the end Hope Valley, edged between the White Peak parts of the Peak District. 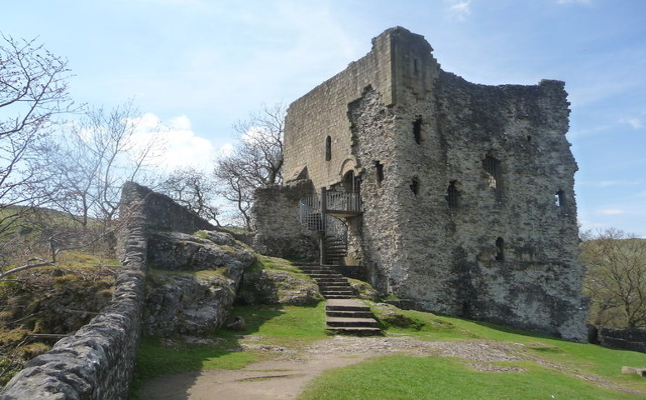 It possesses breathtaking landscapes, historical sights including Peveril Castle, and unique earth science both above and beneath its ground. Walkers may enjoy travelling along the routes to Mam-Tor, which happens to cross paths with four show caves: Treak Cliff Cavern, Blue John Cavern, Peak Cavern and Speedwell Cavern. Every Christmas this stone village is transformed into a winter wonderland by its galore yuletide decorations, coruscating lights, and candlelight carol concerts, which last until January. Tourists are offered a merry atmosphere and may just be fortuitous enough to explore the seasonal traditions this village has upheld, as well as revived. 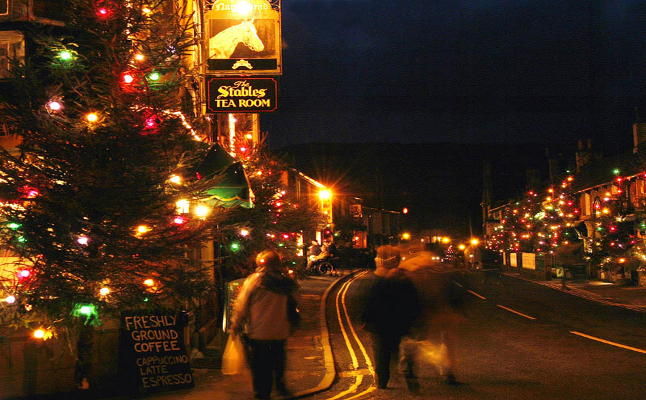 After the erection of a gigantic Christmas tree at the Crystal Palace in 1854, enormous Christmas trees began to dot this village over the years, until this tradition spread to having over 40 colossal, brilliantly decorated Christmas trees in Castleton. Between the months of November until the end of December is a musical time where various cave shows and carolling events are held during this period, allowing Victorian history to come alive in the present day. The tradition of carol singing was seen as a pleasing form of musical entertainment to the Victorians, who actively revitalised and popularised it. Castleton’s practice of candlelight carolling inside caverns picks up on this tradition and brings it to life with Treak Cliff Cavern selling tickets for ‘Carols by Candlelight’ concerts that are immensely popular, heart warming occasions. 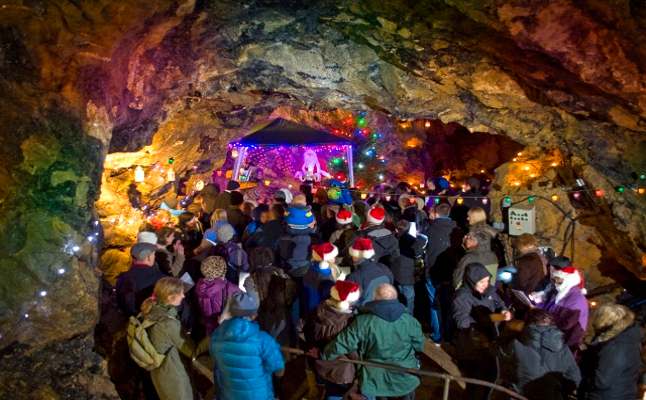 Likewise, Peak Cavern will be the venue to ‘an Evening of Carol Singing and Brass Band,’ which take place during several times over the duration of the month. The effervescent current of Peakshole Water leads to Peak Cavern (Devil’s Arse) and through the traditional part of Castleton to merge with the River Noe close by Hope. Along the main streets are a large variety of boutiques, local shops, cafes and restaurants. Gifts brought here are inimitable as they are fashioned out of the Blue John stone (also known as Derbyshire Spar), a semi-precious fluorite found solely at Blue John Cavern and Treak Cliff Cavern. Named from the French “Bleu Jaune” meaning Blue Yellow, the origin of the colour remains a mystery, though its ornamental value was appreciated during the 19th century when it was mined, and made into items such as knife-handles to chalices. Polishing your own Blue John Stone usually takes place during school breaks, when tourists may choose and polish a slice of Blue John to take home as a souvenir. 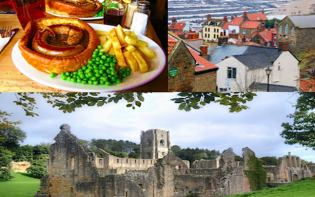 Every December, Castleton arranges festal activities for families as well as social events to either engage in friendly competition or establish a wholesome place to meet new people and socialise. Children have the opportunity to ride with Father Christmas in a horse drawn cart that parades throughout Castleton village for hours on end. Many might also find themselves delighted in Santa’s Grotto which is held every weekend in Castle, where gifts are handed out by Father Christmas or toys may be created in the workshop. Christmas Activity Week allows the opportunity to exercise creativity with craft making activities and cultural games. Mulled wine, roasted chestnuts and mince pies are popular during these months and may be enjoyed during the licensed late night shopping every Thursday, Friday and Saturday until 9pm in the evening. Spontaneous street performances occur throughout the day on the spot which include acts from travelling carol singers, Morris dancers, and bagpipe musicians. Whether one wishes to join the Christmas carollers in the underground caves or simply enjoy the festive yuletide mileu, Castleton brings forth past traditions and honours them as a means to entertain and welcome guests wishing to participate in the holiday season. How might cultural traditions establish connections with people?